Figure A. FITC conjugated Mouse anti Canine CD3 (MCA1774F) and RPE conjugated Rat IgG2a isotype control (MCA1212PE). Figure B. FITC conjugated Mouse anti Canine CD3 (MCA1774F) and RPE conjugated Rat anti Canine CD4 (MCA1038PE). All experiments performed on red cell lysed canine blood gated on mononuclear cells. Figure A. RPE conjugated Rat anti Canine CD5 (MCA1037PE) and A647 conjugated Rat IgG2a isotype control (MCA1212A647). 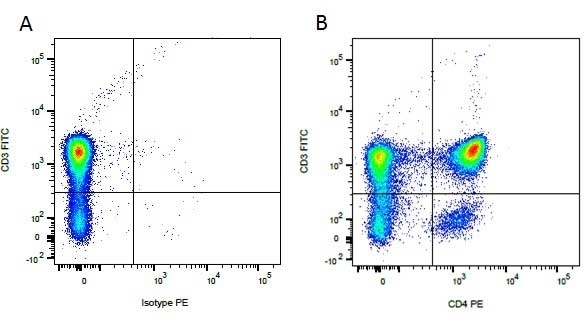 Figure B. RPE conjugated Rat anti Canine CD5 (MCA1037PE) and A647 conjugated Mouse anti Canine CD4 (MCA1038A647). All experiments performed on red cell lysed canine blood gated on mononuclear cells. Rat IgG2a isotype control for measurement of non specific binding of rat monoclonal antibodies. This antibody recognizes a human surface antigen. 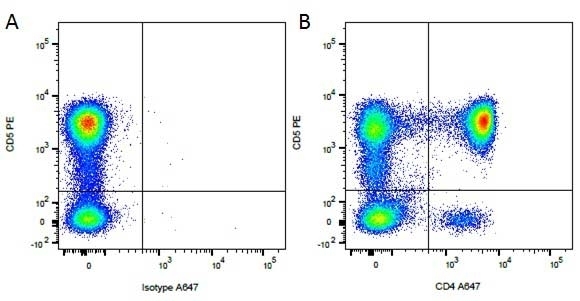 Rat IgG2a Negative Control antibody is suitable for the assessment of the level of non-specific binding of rat IgG2a monoclonal antibodies to mouse cells. Test results indicate Rat IgG2a Negative Control antibody is also suitable for use as a negative control with dog cells. N.B.This antibody recognizes a human cell surface marker, and therefore is not suitable as a negative control in human cells or cell lines. Spleen cells from immunized DA rats were fused with cells of the rat Y3/Ag1.2.3. myeloma cell line. This product should be stored undiluted. This product is photosensitive and should be protected from light. Avoid repeated freezing and thawing as this may denature the antibody. Should this product contain a precipitate we recommend microcentrifugation before use. Storage in frost-free freezers is not recommended. This product is photosensitive and should be protected from light. Storage in frost free freezers is not recommended. This product is photosensitive and should be protected from light. Storage in frost-free freezers is not recommended. Avoid repeated freezing and thawing as this may denature the antibody. Should this product contain a precipitate we recommend microcentrifugation before use. Prior to reconstitution store at +4oC. Following reconstitution store at +4oC. 12 months from date of reconstitution. The Pacific Blue® dye antibody conjugates in this product are sold under license from Molecular Probes, Inc. for research use only, except for use in combination with microarrays, and are covered by pending and issued patents. Where this antibody has not been tested for use in a particular technique this does not necessarily exclude its use in such procedures. * It is recommended that the user dilutes the antibody to a concentration equivalent to their test reagent. Where this antibody has not been tested for use in a particular technique this does not necessarily exclude its use in such procedures. Suggested working dilutions are given as a guide only. * It is recommended that the user dilutes the antibody for use in their own system to a concentration equivalent to their test reagents. Where this antibody has not been tested for use in a particular technique this does not necessarily exclude its use in such procedures. * It is recommended that the user dilutes the antibody for use in their own system to a concentration equivalent to their test antibody. Where this antibody has not been tested for use in a particular technique this does not necessarily exclude its use in such procedures. Suggested working dilutions are given as a guide only. * It is recommended that the user dilutes the antibody for use in their own system to a concentration equivalent to their test antibody. Where this antibody has not been tested for use in a particular technique this does not necessarily exclude its use in such procedures. * It is recommended that the user dilutes the antibody for use in their own system to a concentration equivalent to their test antibody. Where this antibody has not been tested for use in a particular technique this does not necessarily exclude its use in such procedures. *It is recommended that the user dilutes the antibody to a concentration equivalent to their test reagent. Use 10ul of the suggested working dilution to label 106 cells in 100ul. Use 10ul of the suggested working dilution to label 1x106 cells in 100ul. * It is recommended that the user dilutes the antibody to a concentration equivalent to their test reagent. Sumagin, R. et al. (2008) Leukocyte-endothelial cell interactions are linked to vascular permeability via ICAM-1-mediated signaling. Am J Physiol Heart Circ Physiol. 295: H969-H977. Chiu, W.C. et al. (2011) Effects of dietary fish oil supplementation on cellular adhesion molecule expression and tissue myeloperoxidase activity in hypercholesterolemic mice with sepsis. J Nutr Biochem. 20: 254-60. Guilloteau, L.A. et al. (2003) Nramp1 is not a major determinant in the control of Brucella melitensis infection in mice. Stapleton, T.W. et al. (2000) Investigation of the regenerative capacity of an acellular porcine medial meniscus for tissue engineering applications. Tissue Eng Part A. 17: 231-42. Park, S.W. et al. (2012) A1 adenosine receptor allosteric enhancer PD-81723 protects against renal ischemia-reperfusion injury. Am J Physiol Renal Physiol. 303: F721-32. Schmidt, E.P. et al. (2012) The pulmonary endothelial glycocalyx regulates neutrophil adhesion and lung injury during experimental sepsis. Nat Med. 18 (8): 1217-23. McConnell, M.J. et al. (2009) H2-K(b) and H2-D(b) regulate cerebellar long-term depression and limit motor learning. Proc Natl Acad Sci U S A. 106: 6784-9. Rabadi MM et al. (2016) Peptidyl arginine deiminase-4 deficient mice are protected against kidney and liver injury after renal ischemia and reperfusion. Rabadi, M.M. et al. (2019) Peptidyl arginine deiminase-4 exacerbates ischemic AKI by finding NEMO (NFκB Essential Modulator). Am J Physiol Renal Physiol. Apr 03 [Epub ahead of print].